I was lucky enough to watch a film screening of Django Unchained today. The movie doesn’t come out here until March, so it was cool to see it early with a nice group of filmsters. When I saw the trailer for Django Unchained I was not excited. Some people believe Tarantino’s a genius, but I say until he departs from his winning formula of ultra-violence, bad language, oddball-morally-dubious characters and nerd-witty dialogue, he will not have proven himself a genius in my books. I’d love to see him make a movie that is a total departure for him, to test himself a little. Mind you, I’m not saying that Tarantino isn’t amazing at what he does, I’m just a little tired of his movies all having the same atmosphere. That being said, I’d still rather watch any of his movies than sit through another Terence Malick flick. At least Tarantino movies are actually entertaining. 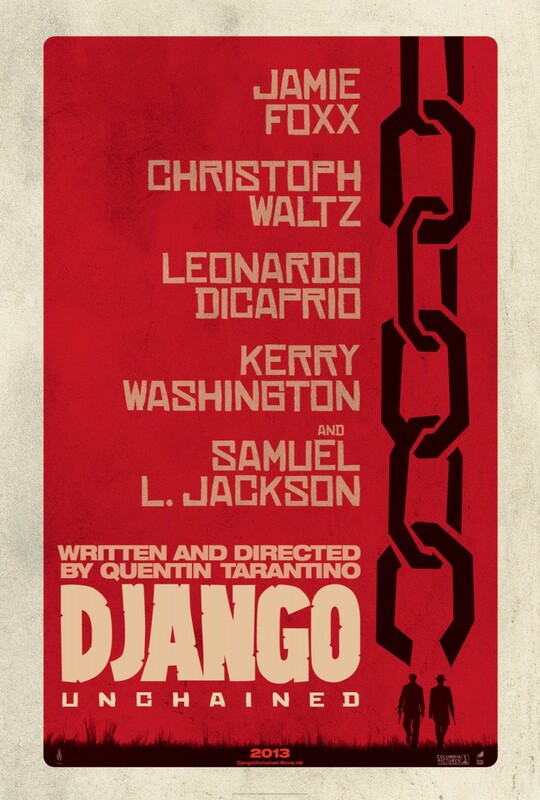 And Django is just that; entertaining. From moments of legitimate comedic delight to moments of over-the-top violence (both funny incidentally) this movie is a riot. In one gun-fight scene, he employs massive, syrupy squibs spewing huge volumes of blood timed with sound effects from incoming bombs; not bullets. The effect is striking. Tarantino does violence so well, because he’s not afraid to wink at you as he does it, letting you know that he knows how ridiculous it looks. There’s also a death scene at the end of the movie, where you can almost see Tarantino literally pulling the strings (or ropes in this case), and saying, “Look, how absurd this is.” Everyone watching laughed, so obviously it worked. As for the actors, Christoph Waltz is fantastic again, and DiCaprio is full of energy and proves that he can play a bad guy just as well as he can a good one. That’s one thing that Tarantino is good at–getting good performances out of actors–and in this film it was a true joy to watch those two on screen. Samuel Jackson is good in it, too, which is saying something considering he hasn’t had a good performance in years. The soundtrack, which is also one of Tarantino’s strengths, was as usual a good mix of good songs. And although I still can’t get comfortable with hip-hop in a period piece: it just doesn’t seem to fit, hearing Richie Havens’ Freedom in the film more than made up for that. Conclusion: an entertaining, well executed movie with good acting from big names. I might even go see it again when it comes to theaters in March. This entry was posted in Moving Pictures, Thoughts and tagged Django, film, review, Tarantino on January 6, 2013 by thelackey.